There’s no doubt that Yamaha makes some of the most exciting motorcycles in the world. And they’ve been able to replicate this excitement with small-capacity bikes in India as well, at least to a certain extent, with the YZF-R15, which through its three generations remains one of the best beginner sportbikes in the country. However, when it comes to their naked bikes, things have taken a turn for the commuter, whether it’s in the 150cc class or even the 250cc class. Now in 2019 though, Yamaha plans to change that with the launch of the MT-15. The MT-15 is powered by the same liquid-cooled 4-valve single cylinder 155cc motor from the R15 v3.0, which means you get the same power and torque figures – 19.3PS and 14.7Nm respectively. This motor also retains its Variable Valve Actuation (VVA) setup, which basically means it’s got a two camshaft profiles – one which sets valve timing and lift at low rpm and the other at high rpm. So the engine provides great response in the low- to mid-range without sacrificing top-end performance. But since the MT-15 is a road-focussed bike (unlike the R15, which is more at home on the track), Yamaha have also seen fit to make the rear sprocket larger (52 teeth from 48), to shorten the overall gearing. So the engine now seems to rev faster and bottom-end response is much better at the expense of a strong top-end. Now since we were using the second half of the Buddh International Circuit to test out the MT-15, we didn’t have a long enough straight to test out just how fast the bike could go. But acceleration out of corners definitely felt quick. And considering that with a kerb weight of 138kg, the MT-15 is 4kg lighter than the R15 v3.0, we expect to see better acceleration figures (at least in the zero to 60kmph run) once we get the bike for a road test. The overall experience of riding hard on the MT-15 is also enhanced by the same slick-shifting 6-speed gearbox that you get on the R15 v3.0, which also comes with a slip-and-assist clutch. Compared to the international-spec MT-15, there are some key mechanical changes on the Indian version. Firstly, just like R15 v3.0, the upside down forks of the international bike have been dropped in favour of conventional telescopic units. 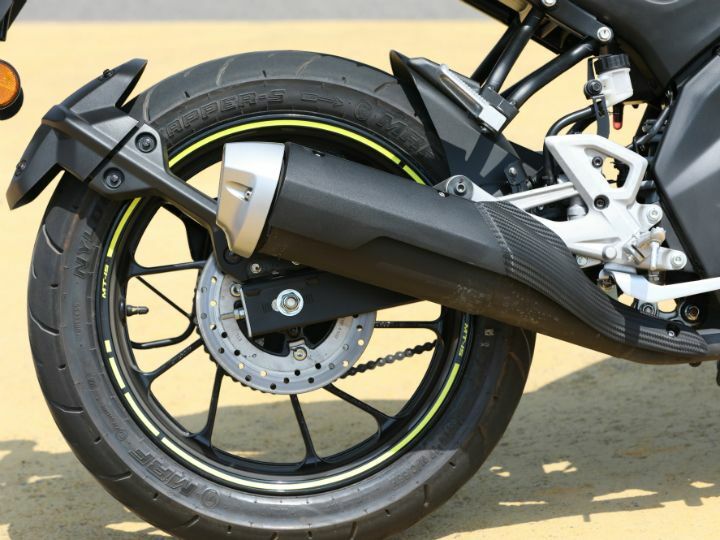 Second of all, unlike the international MT-15 or even the Indian R15 v3.0, the Indian MT-15 doesn’t get a cast aluminium swingarm, but instead features a steel box-section swingarm. We believe both these changes have been made in order to keep costs down. The Deltabox frame which is key to the R15’s phenomenal handling prowess has been carried over unchanged though. Also, the rake angle hasn’t changed between the R15 and MT-15, and while the official Yamaha website mentions the same 88mm trail for both motorcycles, we were told by the tech guys at the press conference that the MT-15 features a different fork offset to reduce the trail a little bit. 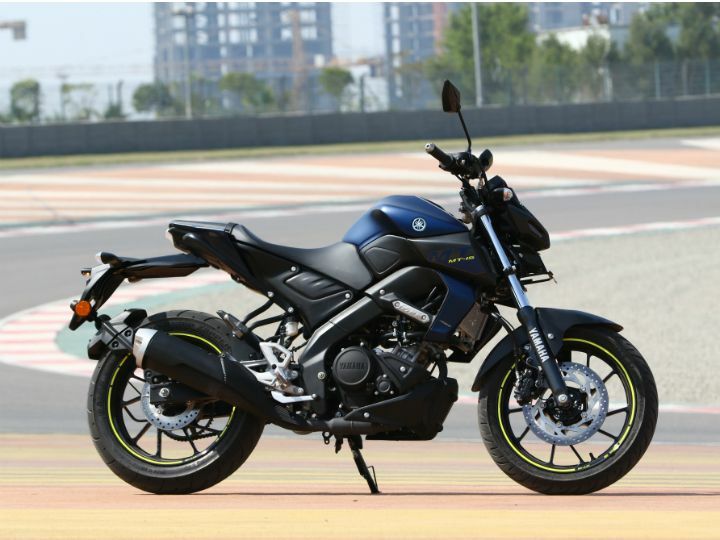 With the upright riding stance keeping the weight off the front, and the extra leverage the wide handlebars provided, the MT-15 was extremely quick to turn in at the slightest input. So much so that the bike actually felt a bit twitchy when attempting very fast direction changes. 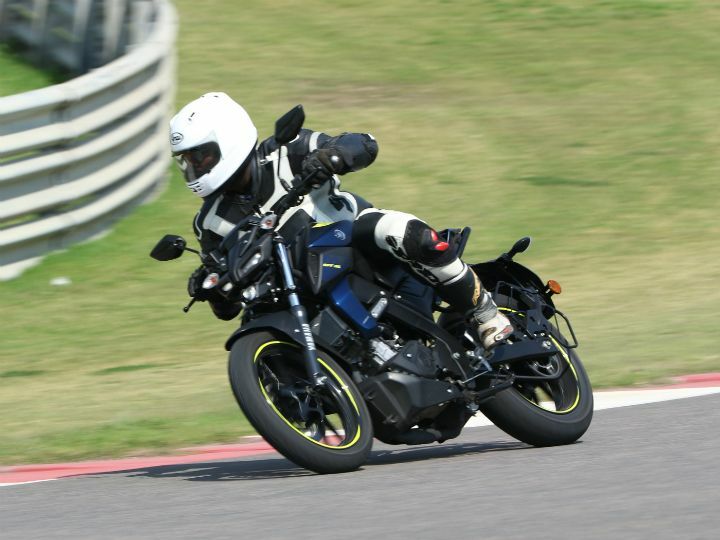 Any ham-fistedness when trying to turn was met with an unnerving, floaty front end feel, and the MT-15 certainly seemed to reward a delicate touch and finesse in steering inputs. 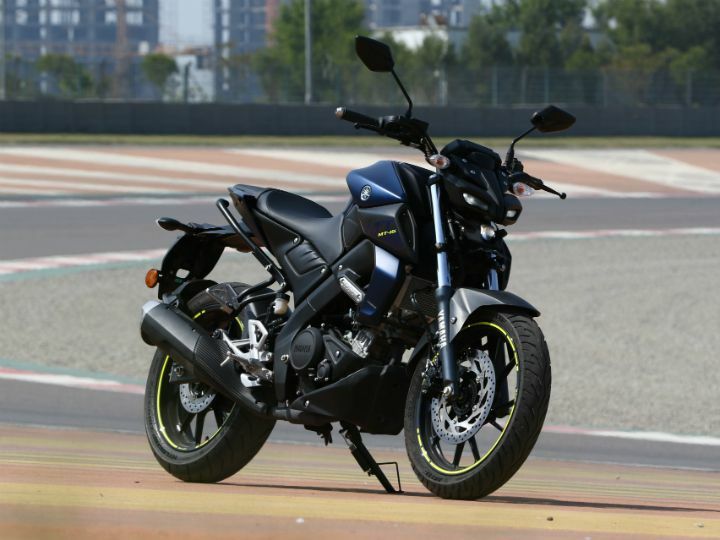 Another hindrance to the MT-15’s lack of handling feedback, we believe, is the choice of rubber. The bike runs on 100/80-17 (front) and 140/70-17 (rear) MRF Zapper tyres. These are non-radial, bias-ply tyres which didn’t feel great on the R15, and they feel even worse here. At least the R15 comes with an optional Metzeler M5 radial for the rear. No such luck on the MT. Brakes have been carried over from the R15 v3.0 as well – a 282mm disc at the front and a 220mm rear disc. Now the R15’s brakes weren’t the best in terms of bite, but had decent feel. However, on the MT-15, they feel significantly worse. The lever felt very spongy, with very little bite, and any kind of hard braking required the use of more than two fingers on the lever. 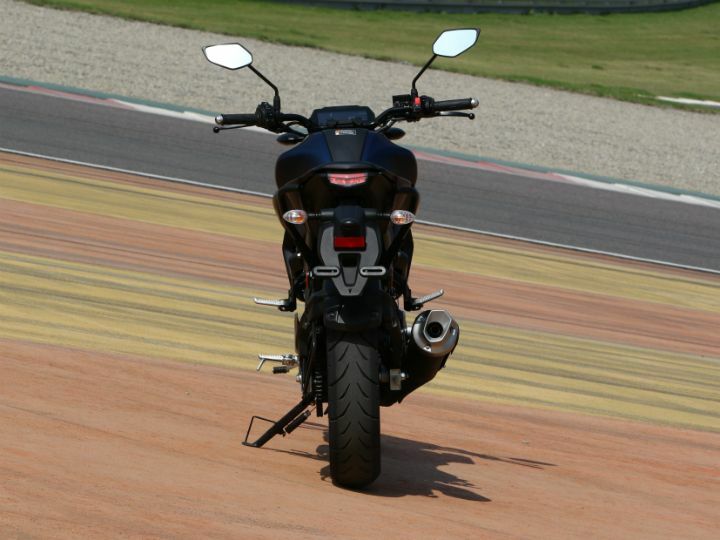 In fact, when trail braking into a couple of the corners on the track, the MT-15 didn’t inspire much confidence. And on top of that, while ABS is standard, the MT only gets a single-channel system as opposed to the dual channel system on the new R15 v3.0. Even in its international avatar, the MT-15 is far from what you’d call a pretty motorcycle. But there’s no question about just how striking it looks. So it’s quite a shame that Yamaha India chose to go with rather dull colours for the Indian version – a dark matte blue like we’ve seen on the FZ v3.0, and black. Even the wacky-coloured wheels from the international bike like red and fluorescent yellow aren’t on offer. Instead, the blue-coloured bike just gets some fluorescent yellow rim tape. And even the wheel design is different and seems to have been taken from the Indian R15 itself. That said, the overall shape hasn’t changed, including that of the robotic-looking LED headlight arrangement with its LED running lights. And since the MT-15’s single LED headlight uses a projector setup, we have a sneaking suspicion it will be better than the R15’s twin LED units in the dark. Moving to the back of the bike, the short, sharp tail of the MT-15 has been retained, but on the Indian bike, the massive grab rails that run along its entire length on each side do spoil the party. 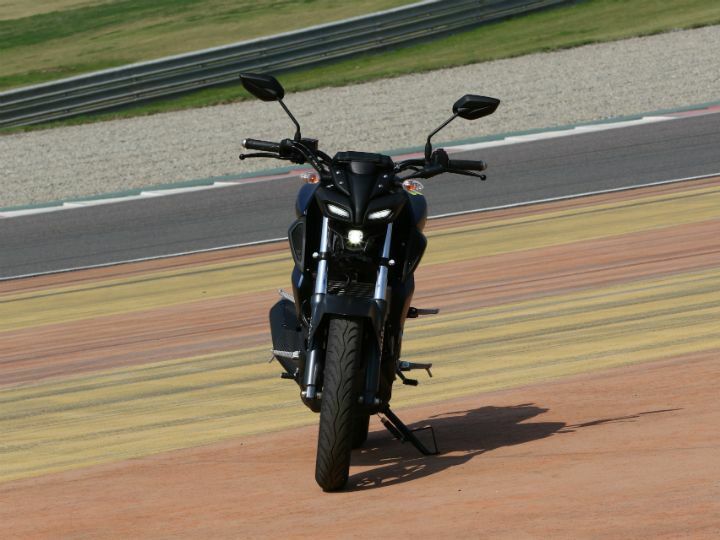 But if you ask us, what leaves the Indian MT-15’s muscular stance incomplete is the lack of USD forks at the front. 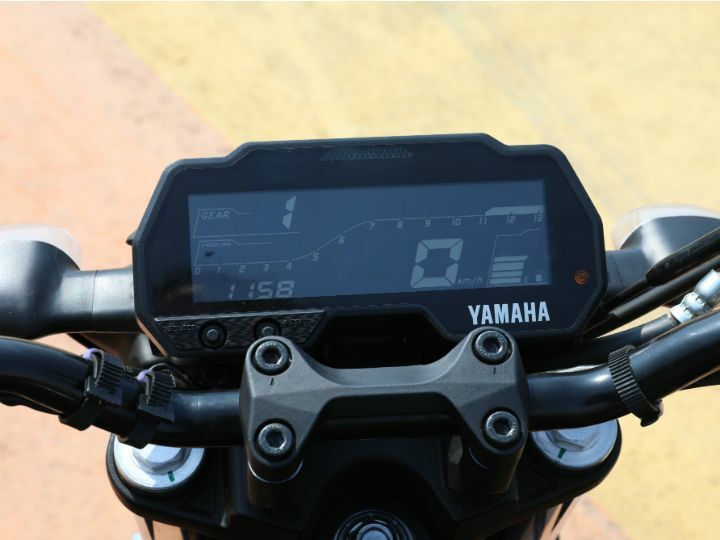 The MT’s fully digital instrumentation is something we’ve seen before on the R15 v3.0, and it features a speedometer, large tachometer line running across the screen, a gear position indicator, odo and trip meters, along with instant and average fuel consumption, range to empty as well as a VVA indicator. A seat height of 810mm (which is 5mm lower than the R15’s) isn’t super-short, and even I, with my height of 5’10”, wasn’t able to get my feet fully flat on the ground. But thanks to the narrow width of the bike and its fairly low weight, it’s fairly easy to manage whether you’re riding or pushing it around in the parking lot. The overall riding stance is fairly relaxed too, with a flat, wide handlebar that’s set fairly low and close to the rider – almost reminding you of KTM’s small Dukes. And since the footpegs aren’t too rear-set, it’s not going to be too stressful on your lower body either. 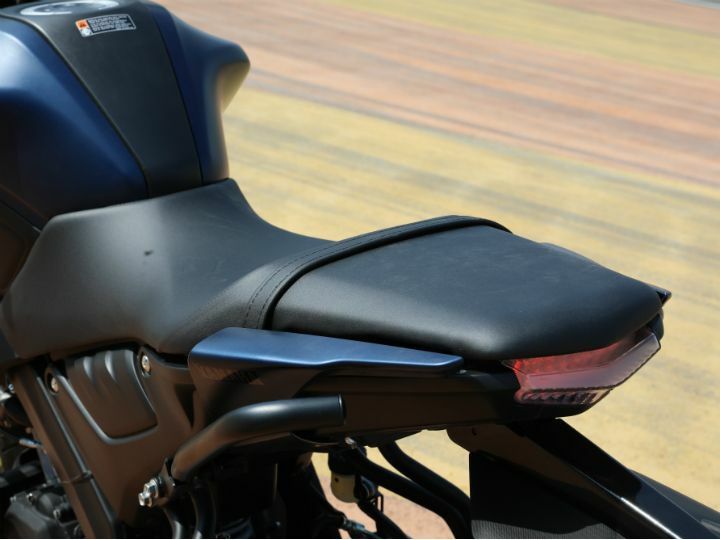 The seat itself is narrow but fairly comfortable, and even though this one-piece unit has a scalloped rider’s section, it’s not so aggressive as to hamper back and forth movement. The pillion section of the seat is a whole different ball game. It’s rather small and unless your back seaters have petite derrieres, they’re mostly going to have a rather difficult time sitting behind. Priced at Rs 1.36 lakh (ex-showroom Delhi), the MT-15 is exactly Rs 3,350 cheaper than the R15 V3.0. And therein lies the problem. The MT distinctly feels lower-spec compared to the R15, especially when you consider the more basic swingarm and inclusion of just single-channel ABS rather than dual-channel. And for that, we were expecting a much lower price – about 1.20 lakh (ex-showroom). At this price, it would’ve been a great bike for those who wanted the performance of an R15 but also something that was easier to live with and more affordable. So coming to the question of value for money… let us put it this way: The MT-15’s faired twin, the R15, was great value for money before it got ABS. And even though its price has jumped up quite a bit with the addition of dual-channel ABS, it can still be justified to a certain extent. Unfortunately, we can’t say the same thing about the MT-15. Sure, we believe it’ll be a good urban motorcycle, and definitely more comfortable than the R15 on a daily basis. But if those are your only reasons for picking the MT-15, then we can certainly think of better options, which will be lighter on your wallet too.